More than nine in ten Americans believe in God, but less than half of those Christian believers attend weekly church service. Corporate worship may not feel as imperative for Protestants who prize a personal relationship with their Savior and who may feel that private scriptural study may suffice. Traditionally, Catholics attended weekly Mass around 75% in 1955 as the Magisterium stressed the “Sunday Obligation”. 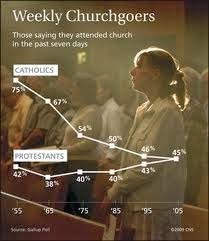 As of 2009, Gallup reports that 45% of Catholics make it to Mass every Sunday. It is a facile conclusion that that Vatican II alienated the Catholic faithful, however there was already a precipitous decline in weekly Catholic worship in 1964, which was before most of the “Spirit of Vatican II” was implemented. Of course, some traditionally oriented Catholics bristled at Novus Ordo “vulgar” (local language) liturgies. But it would be mistaken not to attribute factors which effect the overall culture, such as mobility negating community pressure, increasing agnosticism in secular society et cetera. This weekend, I was visiting with a friend who is a mother of a child who is resistant to going to Church because it is “boring”. Later, lack of church attendance can be rationalized as unbelief or knowing it already. Shortly after this conversation, I had a reminder of why actually going to Church matters. As I have a sacramental religiosity, I know that I am receiving the Body, Blood, Soul and Divinity in the Eucharist at any Mass. Worshiping at my home parish, I can connect with acquaintances with whom I have developed a relationship. But what particularly impressed me, was how even familiar scripture can have new life breathed into them through thoughtful homilies. This past Sunday’s Gospel was the Third Sunday of Lent, where we heard the Gospel of John’s version of the Samaritan woman at the well. In less than twelve hours, I heard three different and thoughtful takes on this Johannine Gospel. In the morning, I listened to Word To Life on SiriusXM's The Catholic Channel, where several Dominicans analyzed the scripture in a traditional manner. 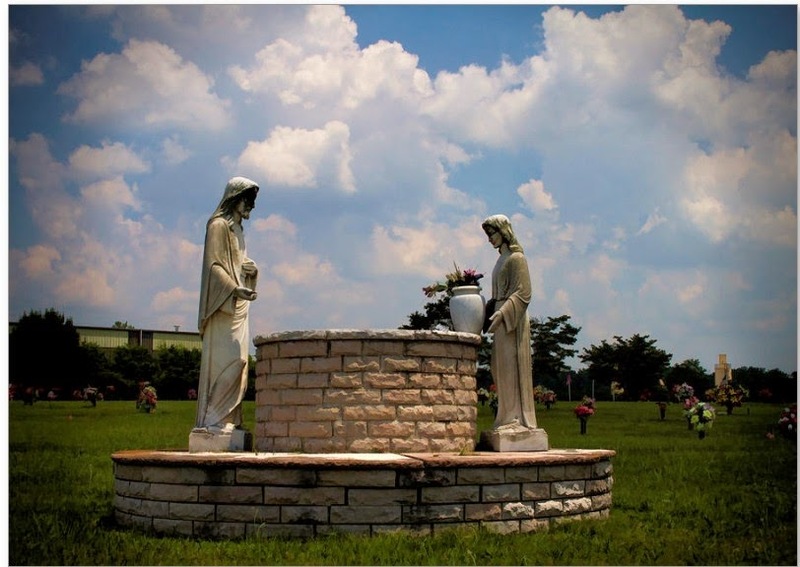 Their message focused on how Jesus knew the sin of the Samaritan woman serial husbands, yet invited her to take from the well where she would never thirst again. This take seemed sensible for Lent, as the faithful come to terms with our sinful nature and are invited to use prayer, fasting and abstinence to better participate in the salvific redemption of the Easter miracle. Prior to the liturgy which I worshiped , I chatted with the lay sacristan. He shared his academic understanding that the five husbands may refer to the five gods that Samaritans historically worshiped as the word ‘baal’ could refer to “god, lord, king, or husband” which tainted their worship of Yahweh. This would jibe with Jesus instance that Jews following the Mosaic code were worshiping correctly. Yet Jesus offers an invitation to a true seeker, such as the Samaritan woman at the well, to follow the Messiah thus opening up God’s Kingdom to more than just the Jews. This was an insightful academic exegesis. During the Liturgy of the Word at Mass, the priest preached a more meta-view message. The homily did not concentrate on the woman in the wel per se but that it is the first of three dialogic gospels before Passion Sunday. These Johannine Gospel stories may only be heard once every three years in the regular church liturgical readings cycle but they are part of the scrutinies every year for new Catechumens. The meta-message of water, blindness and death emphasize the Paschal symbols of baptism, light and resurrection. A conversation is a rare phenomenon, even for Socrates. It is not a confrontation. It is not a debate. It is not an exam. It is questioning itself. It is a willingness to follow the question wherever it may go. It is dia-logue. This “wordy” homily suggested that the Johannine dialogic gospels underlined the opening of the fourth gospel in JN 1:1 In the beginning was the Word, and the Word was with God, and the Word was God." By speaking person-to-person without pretense, Jesus was able to help a true seeker find The Way, even though she was a person (a Samaritan woman) with whom society would have expected a Jewish rabbi (much less the Messiah) would associate. This demonstrates how God comes to us in our imperfectness to offer relationship. There is no way that I would have garnered this insight resting upon my own laurels with the conceit that “I’m already familiar with that scripture.” These faithful encounters with scripture really deepened my faith, giving increased historical, sacramental, seasonal and scriptural insight. While such a testimony might not make it seem less boring to an argumentative adolescent, it should lend credence to how we can hear the Proclamation of the Word differently at different stages of life and through different hermaneutic lenses which compliment rather than contradict each other. The more profound challenge is to live the Word in our everyday lives.